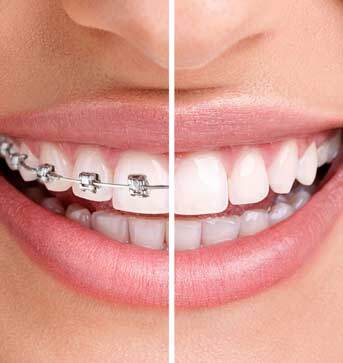 Shawnessy Smiles offers South Calgary Orthodontic Dentistry to correct misalignment of your teeth and jaw. Orthodontic dentistry has come a long way over the years, and there are now a number of treatment options including traditional wire braces and dental appliances. When you schedule your South Calgary Orthodontic Dentistry consultation, the team at Shawnessy Smiles will identify the best orthodontic options based on your needs and budget. Orthodontic dentistry is the primary method for treating teeth that that are not properly aligned. We use orthodontic treatment to correct teeth with a number of issues, such as spaces, cross-bite issues, rotated teeth, crowded teeth, and many other orthodontic problems. A straight smile is an immediate way to make a great first impression, but orthodontic dentistry can do more for your oral health, aside from aesthetics. Teeth that are not properly aligned teeth can sometimes cause dental issues such as tooth decay and gingivitis because misaligned teeth are harder to clean. Improving any bite irregularities will also help you chew your food better and speak clearly. Brushing and flossing your teeth is much easier! When your teeth are aligned properly, the teeth share the load of the biting and chewing meaning there is less wear on your teeth over time. When your bight is aligned correctly, your jaw muscles are relaxed and put less pressure on your jaw joint, teeth, gums and supporting structures, including your head and neck muscles. There is no age limit for orthodontic treatment. Many adults are now seeking treatment to correct their smile for healthier teeth and gums. We know that your smile is important to you and correcting misaligned teeth with our South Calgary Orthodontic Dentistry is one of the many dental health services that we offer here at Shawnessy Smiles. Call us today at (403) 254-1124 to make your appointment to learn more about South Calgary Orthodontic Dentistry at Shawnessy Smiles Clinic!